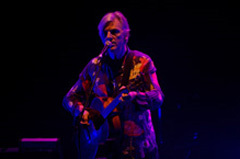 Legendary singer-songwriter , Robyn Hitchcock , is the subject and star of this concert documentary. In the winter of 2008 , Hitchcock travelled with his band by train to New York to resurrect live in concert his 1984 album 'I Often Dream of Trains' , which has grown into a cult classic.
" Director John Edginton captures the true essence of Robyn in concert, and retains his crazy and slightly inane banter between songs – which can sometimes prove to be even more surreal than the lyrics themselves, and help make this a veritable joy to behold. "